Drawing with your kids shows them that it’s not just an artist’s endeavor. Banish the phrase, “I’m not artistic” from your mind and vocabulary, because you don’t need to be able to render a perfectly-shaded apple to be artistic. Now. 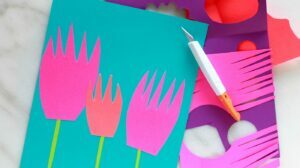 Let’s get to this fun drawing project- you can do this with kids of all ages, so it’s a fun creative family project. Throw in some popcorn and wine juice- and you have a good old-fashioned drawing party! I originally wrote about this in my post, Drawing Games For Kids. 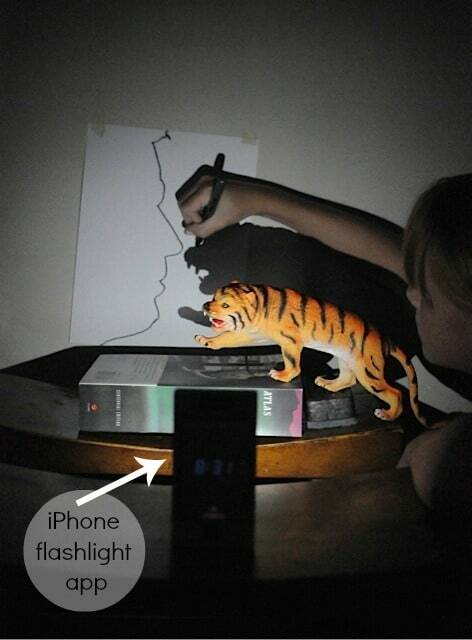 All you need is a flashlight (or iPhone flashlight app, which works beautifully), some paper, and markers. And of course items to trace. Someone can hold the flashlight, or you can figure out how to prop it up so it stays still. Position it so it shines at the wall where you have a taped up piece of paper. Do a household search to find some toys or objects with interesting shapes, and prop them near the wall so their shadow falls onto the paper. You’ll have to move the object/paper around a little to find the optimal placing. We ended up using 2 stools, with the light set on the back stool, and the objects on the stool closer to the wall. Play around with how close the objects are to the wall and light. 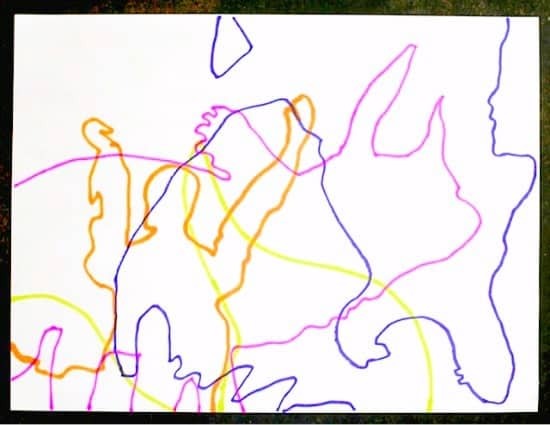 Play around and overlap different shapes, using different colored markers for each tracing. We flipped the paper different ways on the wall when we switched objects to trace. Try to fill the paper, but decide when it’s time to stop adding shadow-tracings. This is an important lesson to learn in composition and graphic design. Is it too early to teach kids that less is more? After you’ve traced a few shadows, you can enjoy your drawings as-is, or add to them with more markers, colored pencils, watercolors, anything goes! Glitter, maybe? Looking for more great drawing ideas for kids? Here is a post I wrote with 100 of them! Wow, that is fun and easy to do! Love it! Okay… this might just be my favorite activity you’ve posted so far. Love it! 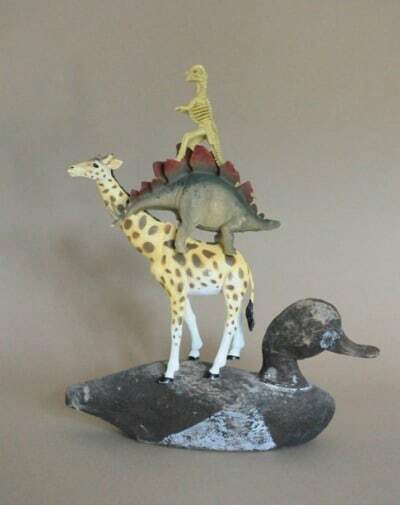 This is BRILLIANT, Jeanette! I love that you can just use your iPhone app. Can’t wait to try it with the kids. Thanks, Krissy! iPhones are pretty much good for EVERYTHING. Oh, that’s an awesome idea! They’ll have a blast. What a fun idea! 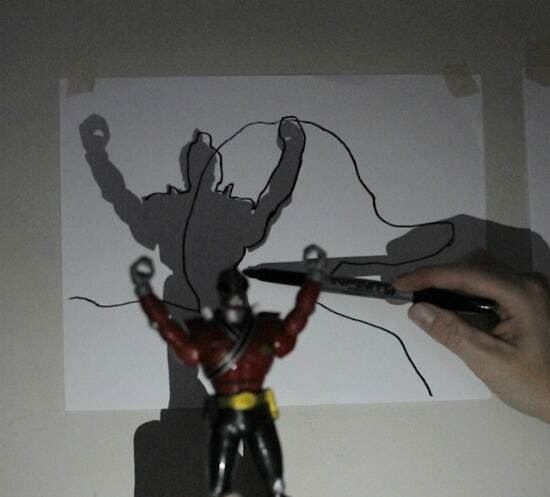 And the flashlight app makes perfect shadows. 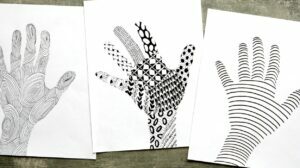 This a great interactive drawing project. I love how easily a child can see how 3D becomes 2D and abstract. Looks like fun. It’s super-fun! Part of the fun is being able to do an art project in the dark, too. This would be a very engaging activity. I can imagine then using watercolours to paint the outlines. That’s a great idea! I think we may have to try that and make it a 2-part project. I can not wait to try this! LOVE. Yippee! We need to do this again, too. This was one of my faves.